There is an Asian parable about a group of blind men and an elephant. The men try to determine by touch what the elephant is like, but each touches a different part of the great creature – a leg, the trunk, an ear… – and so each comes to a different conclusion. 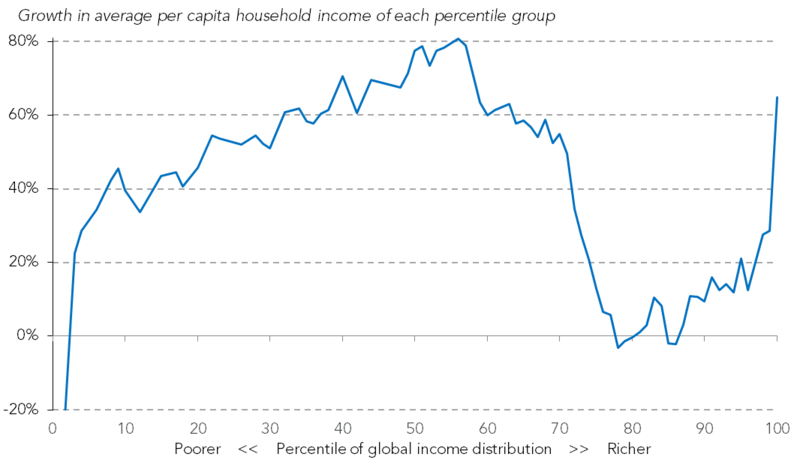 In contrast, commentary on the ‘elephant curve’ which is featured in Branko Milanovic’s recent book ‘Global Inequality’ – and described as “the most powerful chart of the last decade” – has tended to come to shared conclusions. But are those conclusions right? 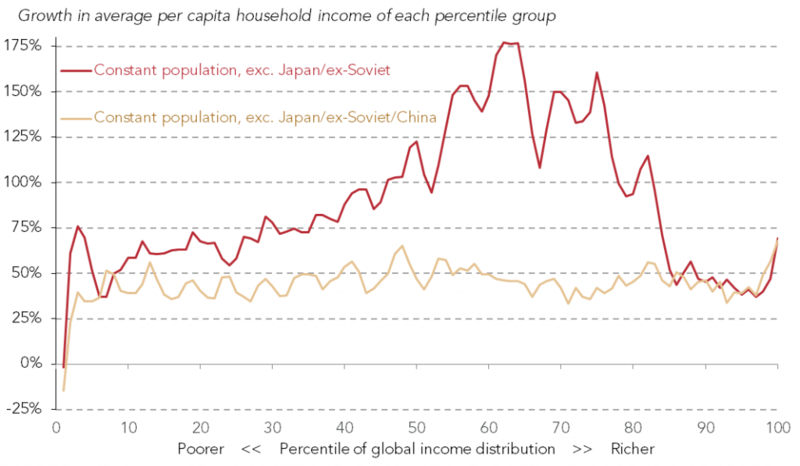 The chart, replicated below, shows how average household incomes (on a per capita basis) have grown between 1988 and 2008 for each part of the global income distribution, from the poorest on the left to the global top one per cent on the right. You might just be able to imagine an elephant’s tail on the left, with its trunk lifted up on the right hand side, but if not then see here for a helpful drawing. A further conclusion drawn by some is that all of these are linked: as international trade and competition has increased, it has boosted the incomes of poorer countries and of high-skilled, capital-owning Westerners but at the expense of the working class of richer countries. There may be some truth in all of this, but our new paper shows that it is inaccurate to conclude that incomes have stagnated for the lower middle class of the rich world over this period. Furthermore, it is wrong to conclude that domestic policy is of little importance in the face of global trade pressures. Unlike in the parable, the mistake made by some commentators is less one of failing to see the big picture and more one of failing to look at any of the constituent parts to understand what’s really happened within rich countries over this period from 1988 to 2008. Below are three alternative graphs that use the same underlying data but provide a different perspective. With the elephant curve and graphs like it, it’s important to note that they compare the average income of, say, the richest one per cent in the world in 2008 with the richest one per cent in the world in 1988. But those two groups might be composed of completely different people. It compares the income distribution of two years: it does not follow the performance of individual households. What is slightly unusual, however, is that the list of countries used by Milanovic and Lakner in 2008 is not the same as the list for 1988. Inevitably there isn’t data for every country on the planet, particularly back in 1988, but the addition of countries to the data from year to year (or their removal) complicates comparison across time. If we use only those countries for which there is data in both years, we find that growth was higher across the distribution, as shown by the yellow line below – with the original curve in blue for comparison. More significant, however, is the impact of uneven population growth across the globe. Population growth across this period was higher in poorer countries – meaning that by 2008 there were more poor people and relatively fewer rich people. This dragged down on average incomes globally. Of course, this is an important part of global economics and we shouldn’t ignore it, but to give a better idea of what has happened to rich countries, the red line below demonstrates what the elephant curve would have looked like if all countries had the same relative sizes in 2008 as in 1988. 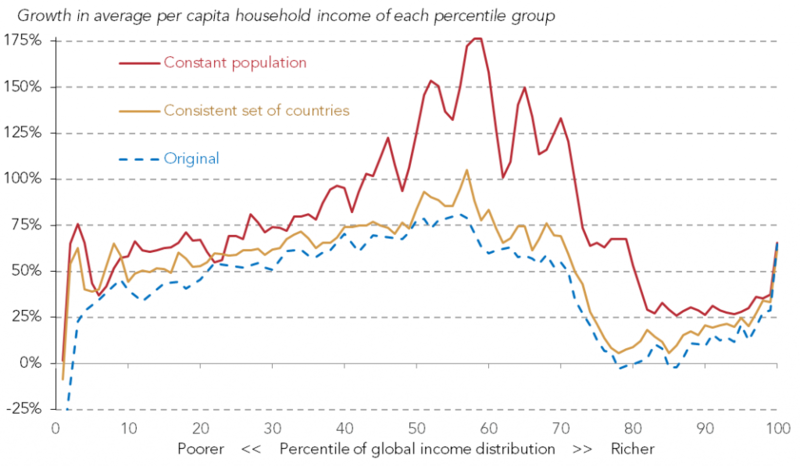 The curve clearly shows higher growth – and cumulative growth of over 25 per cent in the lower ‘rich world’ part of the distribution when such compositional effects are removed. An exploration of the individual country data behind the elephant curve shows that weak growth for the mature economies is actually driven by Japan and ex-Soviet satellite / Baltic states, rather than by the ‘Western’ countries one might think of. In the case of Japan, a very large fall in income appears to be simply incorrect (though quality data is publicly hard to come by). And the growth figures for Eastern European states are dominated by large income falls during the collapse of the Soviet Union. As with population change, this is again an important part of the global story but means the curve isn’t showing quite what some people think it does. The fall of the Berlin Wall does not tell us much about the effect of Chinese trade on British incomes, for example. The red line below uses a constant population and consistent set of countries, but for demonstration also excludes these countries. Now the weakest growth shown in the ‘trunk’ is around 40 per cent: below the growth rates of most of the rest of the graph but far from the stagnation of the original elephant. Just as interesting is what happens to this modified elephant curve if we also remove China. This is shown in the yellow line. Then, growth across the world looks remarkably even at around 40-50 per cent. This demonstration highlights the overwhelming importance of China – with its large population and exceptionally high growth – to the shape of the elephant curve. But all of these curves combine data from across the world. If we want to explore how particular groups within particular countries have fared, why not just check that data? 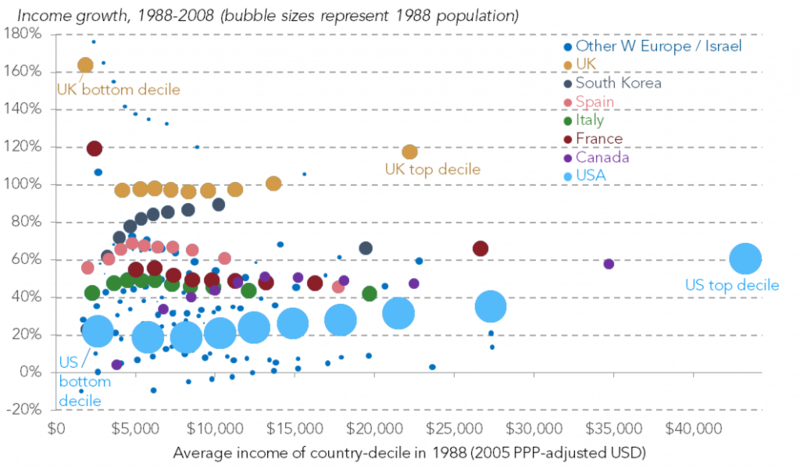 The graph below shows 1988-2008 growth for each decile of each Western country in the data, with the actual average incomes of those deciles in 1988 at the bottom with the poorest on the left (and the size of bubbles representing 1988 population). This confirms what is suggested above, that there is no overall stagnation among mature economies. But it also shows that there has been a wide range of experiences between countries. The US is a notable outlier, with growth dominated by the richest decile. Most other rich countries have had decent growth. Bear in mind that 50 per cent growth over a 20 year period means an average of 2 per cent per year (or a doubling every 35 years). UK growth, particularly for the poorest, looks if anything too strong compared to what we find in other data sources. Notes: Axis is cut off at 180 per cent. Start and end years may differ slightly from 1988-2008 but growth rates are adjusted to 20-year equivalents. And of course different periods can also show very different levels and patterns of growth, as our paper and our interactive web page show for the UK. So, using the same data that underlies the elephant curve, it would appear incorrect to say low and middle incomes in the rich world have stagnated. Of course such averages hide a multitude of sins, and international competition has certainly produced losers at local, sectoral and individual levels, and may have provided some downward pressure for others. But the fact that there are such differences between the experience of rich nations (and that the US relies less on international trade) lends itself to the idea that periods of poor growth and/or increases in inequality are down to domestic policies such as on taxes, benefits, active labour market policies, housing, and financial regulation just as much as any global forces. The elephant curve is an extremely useful contribution to the globalisation debate (as is the brilliant data resource underlying it which is shared by the curve’s authors). Like any elephant, it rightly attracts a lot of attention. But it doesn’t show what many people think it does. As ever in economics, the story is more complicated and we need to explore the underlying data from other angles too if we are to get the full picture and draw the right conclusions for future policymaking.